The two token varieties prepared for circulation are very scarce. All varieties struck with this die combination are rare. Fuld NY630BG-2b (brass) R-7 Nice UNC Strong Reverse Doubling. It has a Russian Word Spelling error. It is listed as MI-370B-1. It is brass. See photos to judge condition, grade, detail, and any wear. THE SE ARE FROM MY COLLECTIONS OF 55 YEARS! ASK A NY. This token is certified XF 45 BN by NGC. (NGC XF 45 BN). There is no date on the token. (1860) CIVIL WAR TOKEN. There is a small scratch on the NGC holder. I have owned and viewed 1000's of PCGS slabbed coins. It has brownish color with subtle tone and fairly strong detail. Nice chocolate brown color token. Minn. tokens are always hard to find. ✪ Rare - Fuld 128/290 Brass - Original Surfaces ✪. 1864 Abraham Lincoln Patriotic Civil War Token. Uncirculated 1863 Civil War Undertaker Store Card Token J.J. Diehl! Uncirculated condition. Grading is an art, not a science. Several subjective factors of personal preference may be considered different by others. These include strike, toning, color, blemishes, & eye appeal. Abraham Lincoln For President 1864 U.S.
We GUARANTEE that any non-certified coin that you purchase from us will grade at least the same grade as purchased or higher through any of E-Bay's approved grading services! This guarantee does not apply to coins which we have labeled as cleaned or having other problems. This allows you to buy our non-certified coins with complete confidence. All non-certified coins have been graded by Dale L. Williams, a former grader for PCGS. He was also a finalist in the World Series of Grading. CollectorUSA wants you to be happy with the coins that you purchase. If for any reason you do not like a coin you get from us, please return it for a full refund of the purchase price. If you do not hear from us concerning any problem you may have, please contact us at 800-422-0787. Thank you. It is the WI-410L-1a variety with a rarity of R6. Graded AU58 by NGC. 1861-65 New York NY F-630BY-1a C Tollner & Hammacher Civil War Token NGC MS65BN! D.L Wing & Co. Albany NY Union Flour Civil War Store Card Token NY0101-8 R3. Beautiful AU example from my collection of Civil War tokens and store cards. Shipped with USPS First Class Package. Chicaco should have been Chicago (Misspelled). 1863 Indian Head Army & Navy Civil War Token F#91-303b R-3 Beautiful Example. Shipped with USPS First Class Package. 1863 Liberty Cap Army/Navy Civil War Token Fuld 11-298C. Token is beautiful with a blue/purple tone toward the edges on both obverse and reverse. Shipped with USPS First Class Package. Civil War token Fuld NY630BB-12c R8 NGC MS65. 399 B’Way, NY 1863 Not One Cent with small George Washington portrait. 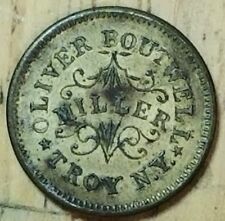 1863 CIVIL WAR TOKEN BROAS BROs / ARMY And NAVY NY. Original Luster! Grading is an art, not a science. Several subjective factors of personal preference may be considered different by others. These include strike, toning, color, blemishes, & eye appeal. You will receive item in photos. A "millions for defense.not one cent for tribute" large token. in very fine condition. also in very fine condition. and aCivil War era 2 cent coin. again in very fine condition. Good luck to all.! 1863 B. Maloney Proprietor National New York NY civil war store card token NY-630-AU. Shipped with USPS First Class Package. 1863 Broas Brothers Army & Navy Civil War Token. Brilliant Uncirculated condition. Grading is an art, not a science. Several subjective factors of personal preference may be considered different by others. We have tried to do free shipping on our items as long as we could and now with the high cost of usps shipping we must add in a flat rate shipping charge to our items. We are doing a FLAT RATE shipping of $3.00 on domestic orders and $8.00 on international orders. You can purchase 1 coin or 40 coins and as long as they are paid for as ONE payment the shipping charge will be the flat rate of $3.00 on domestic order or $8.00 on international orders. Here we have one Piedmont Civil War Token. The coin is in raw uncertified condition and is a very nice coin. Please look at the scan and grade the coin for yourself as this is the actual coin you will receive. I do not attach a grade to the coin as grading is very subjective. I will leave that up to you to grade the coin based on the high resolution scan. Civil War token Fuld OH165CZ-1b R3 Nice Uncirculated. 1863 Flag Of Our Union Shoot Him On The Spot Civil War Token. Brilliant Uncirculated condition. Grading is an art, not a science. Several subjective factors of personal preference may be considered different by others. Civil War token Fuld NY630C-8a R4 Nice Uncirculated. C. Bahr Cor Cliff and Frankfort St New York. Not One Cent signed L. Roloff. 1861-65 Detroit MI F-255BY-1a J.D. & C.B. Standish's Civil War Token NGC MS65BN! Civil War token Fuld PA464A-6j R8 NGC MS65. Petersen's Jewellers Honesdale, Scranton & Pittston PA Good For 1 Cent (450-550). 1861-65 F-299/350 d Army & Navy Civil War Token NGC MS65! R8 R-8! Likely struck on a filed down US Cent planchet. Brilliant Uncirculated 1863 For Public Accommodations Civil War Token!